Have you ever encountered with such a situation: you just forget your passcode for iPhone or iPad and when you try to unlock it, your iPhone is just disabled. If you enter the wrong passcode in to an iOS device six times in a row, you'll be locked out and a message will say that your device is disabled. So how to reset your iPhone? Here are several tips for you. Bear in mind that once your iPhone or iPad is disabled, unless you made a backup before you forgot your passcode, there isn't a way to save your device's data. You'll need to erase your device, which deletes all of your data and settings. However, if you have an iTunes or iCloud backup for your iPhone data, you can use iFonebox to extract those data for your iPhone or iPad. Here, I have extracted three different methods from Apple community for you to reset your iPhone when disabled. Once the sync and backup have finished,click "Restore" [your device]. If you've never synced with iTunes or set up "Find My iPhone" in iCloud, you'll need to use recovery mode to restore your device. This will erase the device and its passcode. iTunes will download software for your device. If it takes more than 15 minutes, your device will exit recovery mode and you'll need to repeat steps 2 and 3. Wait for the process to finish. Then you can set up and use your device. 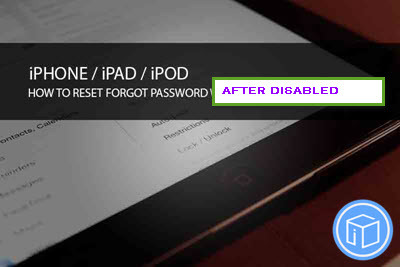 Whenever you are faced with iPhone disabled problem, follow the above tips to reset your iPhone and make it usable. Hope this is helpful to you.